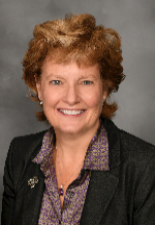 Susan Cross Hume is the Assistant Superintendent of Business Services of the Bonita Unified School District. She has been a school district CBO for 20 years. She started her professional career in public accounting at Vicenti, Lloyd and Stutzman, CPAs. Mrs. Hume is a graduate of Cal Poly Pomona (bachelor’s degree in Business Administration - Accounting emphasis). She holds her CPA (Certified Public Accountant) license from the State of California, and is also a CIA (Certified Internal Auditor) and a CGMA (Chartered Global Management Accountant). Mrs. Hume is a member of the American Institute of Certified Public Accountants, the California Society of CPAs, the Institute of Internal Auditors, and the California Association of School Business Officials. She is a board member and the treasurer of the Alliance for Schools Cooperative Insurance Program (ASCIP), as well as Treasurer and United Methodist Women Board representative for David and Margaret Youth and Family Services. A life-long Methodist, Mrs. Hume is active in her church, Claremont United Methodist, serving on the finance committee, convener of her United Methodist Women circle, and Sunday School teacher. Mrs. Hume is also the treasurer for Kimball Boyd Coburn Ministries. She recently came off of the Board of the International Christian Scholarship Foundation after 18 years, serving 2 terms as president. Mrs. Hume is also a member of La Verne Rotary. Susan is married to Ed, and has two grown children, Eddie and Janet. They live in a 1917 craftsman home in old town La Verne, where they are active in the Historical Society and La Verne Heritage.